Judicial Watch sued for the release of the Pentagon tapes taken on the day of 9/11. 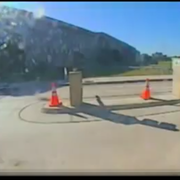 Twitter feed of released video. 1stly Whatever it is??? 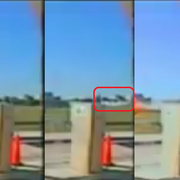 It's height is shorter than the trees that it passes in front of that are in the background of the video ... which means if it is flying ... then it is flying extremely low! 2ndly Whatever it is??? 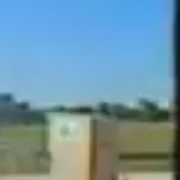 It is very long as its structure is visible from the far right of frame and then extends beyond the concrete pillar, which according to my visual self assessment is about 1/2 yard/meter from the right side edge of the video frame at close range [as judged by the size of the orange witches hat sitting besides the concrete pillar] and the anomalous object in question passes between that pillar and the trees in the far distance and if we place the trees at 330yards away [I measured roughly using google earth app] then the anomalous objects must have passed more than 1 yard/meter away and less than 330 yards/300meters away and this gives it a width of anywhere from half a yard/meter long to about 60 yards/45meters long and anything from from a few inches tall to one quarter as tall as the trees in the background which I estimated at about 45ft tall which would mean 11ft max height of the anomalous object in question. Quote: American Airlines Flight 77 was a scheduled American Airlines domestic transcontinental passenger flight from Washington Dulles International Airport in Dulles, Virginia, to Los Angeles International Airport in Los Angeles, California. The Boeing 757-223 aircraft serving the flight was hijacked by five men affiliated with al-Qaeda on September 11, 2001, as part of the September 11 attacks. 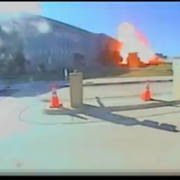 They deliberately crashed the plane into the Pentagon in Arlington County, Virginia, near Washington, D.C., killing all 64 people on board, including the five hijackers and six crew, as well as 125 people in the building. Well look at that ... my figures match up ... IF the anomalous object is about 11 ft [3.75m] tall and about 65yards [45m] long then that places it about 3/4 the distance to the far tree's in the background and that would concur with the eye witnesses accounts of the story and this anomalous object is most likely the Boeing 757 200 jet plane that is claimed to have been deliberately crashed into the Pentagon as a terrorist attack. 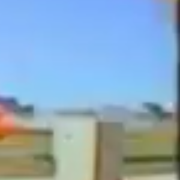 However I don't see any wings or engines or tail fin and so the object in the picture/video itself remains an anomalous structure in my eyes. Personal Disclosure: Do you see what I see??? If you do see what I see then please feel free to speculate wildly as to what it may be ok! I speculate that it was NOT a general ordinance missile due to the sheer size of the fuselage. Which tends to support the argument that a real jet plane did crash there after all. BUT it could still be an antiquated ICBM rocket body such as the Atlas or Titan rockets which both have a body diameter of just over 3m wide and with a length of between 25 and 35 meters long and such speculation can NOT be written off and be considered out of the ballpark since both items .. jet planes and very old icbms just so happen to share some familiar shape, size and scale characteristics with each other. P.S. May all the victims of 9/11 tragedy find peace! 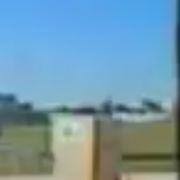 Not sure where my sources are now (they might be on this board somewhere), but I've seen too much evidence to convince me that what hit the Pentagon was not a plane, at least not one with wings. I guess that would make it a missile of some type then, right? I'll see what I can dig up to offer here, but right now, my tummy says it more important to feed it.